As this year’s awards season gets underway, many MM fans will bemoan the fact that she never won, or was even nominated for an Oscar. Of course, there will always be sceptics who believe she was more of a star than an actress. However, when we consider how many acclaimed films she appeared in, and how even her lesser works remain hugely popular, that opinion doesn’t hold much water. Of the hundreds of books devoted to Marilyn, only a few have focused exclusively on her work in movies. Carl Rollyson’s pioneering biography, Marilyn Monroe: A Life of the Actress is perhaps the cream of the crop, with honourable mention for Richard Buskin’s Blonde Heat: The Sizzling Screen Career of Marilyn Monroe, Laurence Crown’s Marilyn at 20th Century Fox, and Cindy de La Hoz’s Platinum Fox, although these books are more visually based. 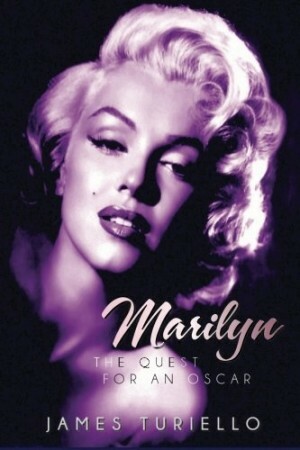 Marilyn: The Quest for an Oscar is the latest book to join this small pantheon. Author James Turiello has previously published a similar book about Errol Flynn, and is working on a third volume about James Dean. Turiello concentrates solely on Marilyn’s career, arguing that her unique beauty and charisma made her a kind of female counterpart to Flynn, whose acting credits were also overlooked by the Academy. In agreement with most critics, Turiello singles out The Asphalt Jungle and All About Eve among Marilyn’s best early films. He also praises her first starring role in Ladies of the Chorus, a B-movie musical that would otherwise have been forgotten. But to my surprise, he virtually ignores her performances in Clash By Night and Don’t Bother to Knock. Her comedic turn in Monkey Business and even her brief cameo in O’Henry’s Full House also deserve further attention. 1953 was the year when Marilyn became an international star, with a string of hit movies (Niaqara, Gentlemen Prefer Blondes, How to Marry a Millionaire.) Turiello recalls his own experience of first seeing Marilyn on the big screen in two 1954 movies, River of No Return and There’s No Business Like Show Business. Although these are generally considered inferior vehicles, Turiello notes how Marilyn made the most of mediocre material, using her star quality to overcome other limitations. The Seven Year Itch (1955) was, Turiello argues, Marilyn’s first Oscar-worthy role. He analyses this film in depth, and her brilliant later roles in Bus Stop, The Prince and the Showgirl, Some Like it Hot and The Misfits, skipping over the less feted Let’s Make Love and the unfinished Something’s Got to Give. Naturally, there are a few minor factual errors. As an author myself, I understand how difficult it is to get everything right – especially with a subject as fabled as MM. But I was a little disappointed to find some quotations commonly misattributed to Marilyn in a chapter devoted to her famous witticisms. In a chapter dedicated to trivia, Turiello also claims that she had an IQ of 168. While Marilyn was certainly an intelligent woman, there is no evidence that she ever took this test. Of course, Marilyn is not the only performer neglected by the Academy. Turiello devotes a chapter to other talents who lost out. However, she is easily one of the most prominent names on that list. Turiello suggests that she should be given a posthumous Lifetime Achievement award. While many fans will agree, the Academy has never awarded a lifetime honour posthumously. Marilyn: The Quest For An Oscar includes black-and-white photos on almost every page, and makes for a pleasant, undemanding read. Whether or not the Academy takes note, fans will certainly appreciate Turiello’s heartfelt crusade to champion Marilyn’s extraordinary achievements in cinema.